A quirky art piece, The Conversation stands on Stephen Avenue in Calgary. 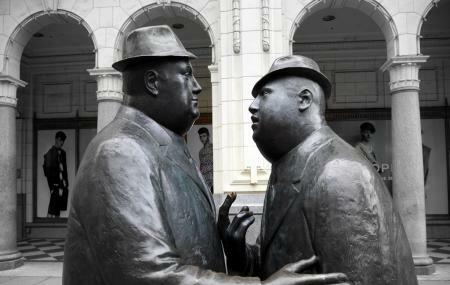 The bronze statue depicts two men deep in conversation. Many believe they are striking a deal, some say they may be debating while some sinister people think the two are plotting a murder! No matter what, join in their conversation and click a few photos while you are at it! The sculpture was donated by Norcen Energy Resources to the City in 1981. How popular is Conversation Sculpture? People normally club together Glenbow Museum and The Blue's Can while planning their visit to Conversation Sculpture. People also prefer to start their day with Conversation Sculpture.